Apple's first big announcement today is a new iPad, the long rumored iPad Pro. In true 'reality distortion field' fashion, they are calling this "the biggest news in iPad since the iPad." Sporting a large 12.9" display (2,732 x 2,048), the iPad Pro retains a 4:3 aspect ratio but the new tablet is as wide as the iPad Air is tall. Because of the much larger footprint, Apple believes the iPad Pro will be great for productivity, with iOS improving multitasking support and split screen operation with two apps on-screen, but also for watching TV shows and movies as well as gaming. With more space, Apple has packed a ton more procesing power. The new A9X SoC is 1.8x faster than the average desktop-class processor according to Apple. The built-in GPU is 2x faster than a console GPU, which as you know is still very slow compared to high-end GPUs in a gaming PC but an impressive feat nonetheless. In fact, the bolder claim Apple made about A9X SoC is that the chip is faster than most laptops released in the last year. In combination with productivity software from the likes of Microsoft (they were part of the iPad Pro presentation, no joke), Adobe, Autodesk or Apple's own iMovie, the new iPad is capable enough to edit edit clips in iMovie, like you would do in MacBook Pro. Now, specs aside, productivity is sure to improve once you get a keyboard. Surface users know this and Apple has taken note. iPad Pro features an optimized full-size software keyboard but also an optional cover accessory that doubles as a physical keyboard. Apple is claiming they have nailed it on the usability side, even though it's their first attempt at it. No doubt they have been working on this for a long time as well as learned from what's already in the market. The keyboard will set you back a hefty $169. The iPad Pro is 6.9mm thick compared to 6.1mm for the Air 2, so still pretty thin. It weighs in at 1.57 pounds which is about the same as the original iPad that came out 5 years ago. The second hardware accessory for the iPad Pro is the Apple Pencil, meaning you get pen input like the Galaxy Note phablets and the Surface Pro. If you heared the crowd, they seemed to be excited about these two features long available in competing products. Apple's showcase for the $99 Pencil was very interesting however on how they are combining input with pressure sensitivity for lighter and stronger strokes, though as far as I understand Microsoft's Surface 3 Pro is very capable and feature-rich in the digital pen tech department already. Other key aspects of the new iPad Pro include a 10-hour battery life, a 4-speaker audio system, it has TouchID, 8MP camera, Wi-Fi ac capable with the option for 150Mbps LTE, and comes in the same colors as previous iPads. 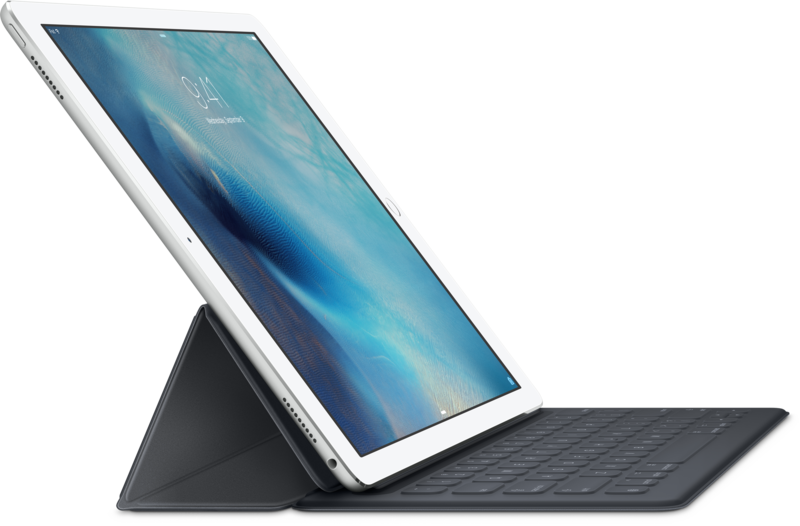 Shipping in November, the iPad Pro starts at $799 for 32GB. The 128GB Wi-Fi model will set you back $949 and the LTE-capable 128GB model costs $1079. Add $169 for the keyboard and $99 for the Pencil, you've got a svelte yet big tablet that is expensive and in full Surface 3 Pro territory.